How to Access Remote Desktop on Mac? Do you know that remotely accessing another Mac device is designed to be easy? With a bunch of ways on how to access remote desktop on Mac, you don’t need to pay a lot of money for expensive remote access software like Apple Remote Desktop. In this article, we’ll provide you with some of the easiest ways on how you can access another Mac remotely. Remote access is the ability to connect to another device or computer from a remote distance. One of the goals of this technology is to eliminate the need for the physical presence of the user when using a device from a distant location. Once connected, the user can now use the remote computer as if he is sitting in front of it. How to Access Remote Desktop on Mac // Remote Access Step 3: Select Options beside iCloud. Here you’ll see a list of things you can store in iCloud. How to Access Remote Desktop on Mac // Remote Access Step 4: Tick the Desktop & Documents Folders checkbox. How to Access Remote Desktop on Mac // Remote Access Step 5: Note that when you checked the Optimise Mac Storage tick box, some of your files will be stored on the Mac device itself. However, when you run out of adequate space, your files will be stored in your iCloud Drive. How to Access Remote Desktop on Mac // Remote Access Step 6: Make sure everything you’re working on is stored to either your Desktop and Documents folder. How to Access Remote Desktop on Mac // Remote Access Step 1: Launch the Screen Sharing app. How to Access Remote Desktop on Mac // Remote Access Step 2: Type in the Apple ID of the remote device user in the box beside Connect to. How to Access Remote Desktop on Mac // Remote Access Step 3: The remote desktop user will receive a notification that asks them to allow their screen to be shared. How to Access Remote Desktop on Mac // Remote Access Step 4: All you need to do is wait for them to accept the request. How to Access Remote Desktop on Mac // Remote Access Step 5: The remote device user can either choose between Observe my screen or Control my screen. If they choose the latter, then you’ll have access to the remote device. How to Access Remote Desktop on Mac // Remote Access Step 1: Launch Google Chrome. How to Access Remote Desktop on Mac // Remote Access Step 2: Look for Chrome Remote Desktop on Chrome Webstore. How to Access Remote Desktop on Mac // Remote Access Step 3: Select Add to Chrome. How to Access Remote Desktop on Mac // Remote Access Step 4: Install Chrome Remote Desktop software on your device. How to Access Remote Desktop on Mac // Remote Access Step 5: You can now log into the corresponding Remote app on either an iPad or another Mac. Now that you know how to access remote desktop on Mac, it’s time for you to utilize that knowledge for your own benefit and good. With an enabled remote access system on your Mac, you can enjoy wider connectivity from anywhere at any time. 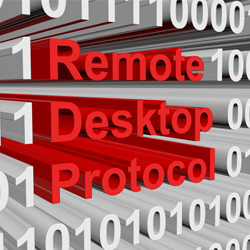 Does Remote Desktop information is useful?